Only recently discovered, Gerald had been passing his retirement years carving birds and small animals, which he then placed on ornately turned bases, and displayed in a small "museum" that he had built in his back yard. He also constructed several large whirlygigs that he placed in his front yard, which led to his discovery. Although initially reluctant to sell any of his work, Gerald does part with a few pieces occasionally, and we are pleased to have been able to acquire the work shown here. 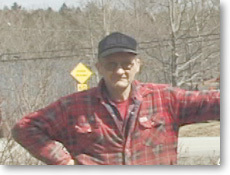 Gerald spent most of his working life in the woods as a lumberman, and also learned to do automobile body work. In addition to his birds and small animal carvings, Gerald also recently completed a set of working model farm implements, completely of wood, with no nails or metal parts.